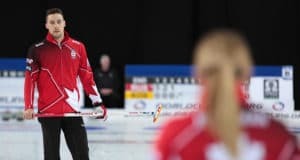 Trailing by one, Koe had given Gushue a chance to escape with a win by giving the defending two-time Tim Hortons Brier champion a superb freeze onto Team Alberta’s counter. That left Koe a try at an angle raise. Gushue said “it wasn’t that shot” that bothered him. 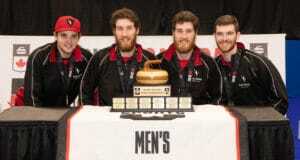 With Gushue, third Mark Nichols, second Brett Gallant, lead Geoff Walker, alternate Tom Sallows and coach Jules Owchar seeking a third consecutive Tim Hortons Brier title and Koe, a three-time champion, it was no surprise the two Canadian powerhouses went at it with neither giving an inch. They traded deuces in the first two ends and again in the fourth and fifth. “It was a good game, lots of intensity, which you would expect when we play Brad. Rough start for us but happy the way we stuck in there and battled. The last two or three he’s definitely beat us more than we beat him so it’s nice to get him at the Brier,” Koe said. Tied 5-5 after seven, Alberta had a chance to steal in eight, but Koe’s last-rock guard attempt moved in the last three or four feet, giving Gushue just enough room to slide by and tap back Alberta’s shot rock to score a single. Koe, with third B.J. Neufeld, second Colton Flasch, lead Ben Hebert, alternate Tom Appelman and coach John Dunn, blanked the ninth to keep hammer for the tenth. 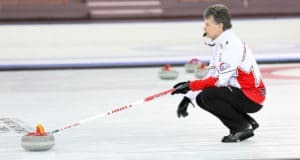 Jim Cotter and Team British Columbia (3-1, Vernon) bounced back from a 10-4 loss to Team Canada with a 7-6 win over Terry Odishaw and Team New Brunswick (1-3, Moncton). Scott McDonald of Team Ontario (2-2, Kingston) won its second-straight game after opening with two losses, by beating Jamie Koe of Team Northwest Territories (0-4, Yellowknife) 10-2. Stuart Thompson and Team Nova Scotia (3-1, Dartmouth) had a trio of three-enders to whip David St. Louis and Team Nunavut (0-4, Iqaluit) 11-2. The 2019 Tim Hortons Brier continues with Tuesday with draws at 9 a.m., 2 p.m. 7 p.m. (all times CST).